Recently, I've noticed it has become socially acceptable for wargamers to play Warhammer ancients. Not so many years ago, admitting to playing warhammer in any form was akin to suggesting you liked to decide games by throwing pencils at each others troops. Wargamers are seldom in a position to feel socially superior to any group, but the teenage audience for Games Workshop were generally seen as the lowest of the the low. To date this transformation of attitudes, driven as it is by a trend towards bigger figures, painted in more cartoony fashions - presented as more realistic on the most doubtful of evidence - has not really cut in to the one aspect of the Games Workshop market I actually play regularly. Warhammer 40,000. Associations with rather too much cryptofacist regalia, blocky weaponry and badly designed rip offs of variously their own fantasy ranges and certain obvious films were bad enough, but the first edition of 40k, as it became known was largely unworkable; fine for a couple of dozen figures a side, and certainly flexible, but over complicated and lacking any realistic structure for the games people wanted to play. Big 'ole battles. After a few games under the old rules, which saw me thrashed by rulemongerers using all the as yet unrestricted tricks in the book (Orks with photon and warp grenades anyone), I gave it up as a bad thing; stored my figures for a while before selling them off. I still earned a meagre living selling the things in a shop, but that's by the by. Many years passed and I lieu of any other local opponents when I moved, I was seduced into trying the game again. Oh my! I don't know what edition they officially were, third perhaps, but finally the rules made sense. All the problems were more or less ironed out (and fourth edition has sorted most of them); forces were balanced, games manageable to play to a conclusion in a reasonable period of time. And even to a point realistic tactically (accepting the huge exagerations implicit in the alien forces). I got sucked into it all again. But of course I started this with a question; why isn't there a developing scene of Warhammer Moderns players? Well to a point there are, they have a yahoo group (virtually silent) and a version of the rules (http://mywebpages.comcast.net/kpavlick/ww2/ww2intro.htm). And having tried them out I found that with some simple adjustments WarhammerWW2 works really well. Yet the few versions of modern gaming using the core system of Games Workshops rules, have stuck to using the Ancients core system. Why? Well; I can only speculate really, myself. But I was once told that GW themselves liked the idea of one day selling historical figures in its' own shops, having games of Alexander versus Darius alongside Dwarves and Orcs. However they got really uncomfortable about the fact thet world war two was the obvious line to take 40k down, Kevin Pavlick developed his version of 40k years ago, and this meant Germans, which equals Nazis. Big problem that, for a company with a chronic image problem to begin with. Many parents, I know from selling stuff to them for years are really uncomfortable with some of the content of Warhammer 40,000. I firmly believe that whislt certain elements became more realistic, the 'Teutonic' overtones prevalent in both early Space Marines, and their arch enemies (Orks and oddly enough early Genestealers) were steadily airbrushed out. It's not a route they seem prepared to go down, too many negatives that would impact on their core business. I understand Mr Pavlicks rules are quietly ignored by GW (there's something too about it not being an infringement of copyright in the USA to modify someones rule system if not for profit); but they aren't ready yet to plug a version of them in their magazines, as they do for the latest 'Ancients' supplement. Too risky. Which to conclude is a shame for there are certain obvious points to having a historical version of 40k; my regular opponent was gently weaned onto historical gaming through Warhammer WW2, after all when he already knew the rules it was just an army that he didn't know. All the concepts are familiar, and the forces remain at least of some interest, thanks to endless war movies and TV shows. Fact is you can always find a 40k'er, not always a wargamer. It's nice to make the two the same thing. For those who don't know, Crossfire is not your average set of wargame rules, in terms of what it tries to achieve, I think it sits somewhere between a tactical simulation and a roleplaying game. It employs several unique game conventions, or should I say abscence of conventions: lack of a fixed game turn, lack of measuring, uncertainty as to composition of one's own force, etc, etc. So anyway We had a game on Sunday afternoon where two companies of US infantry with limited armoured support faced an unknown quantity of Germans late on in 1944. 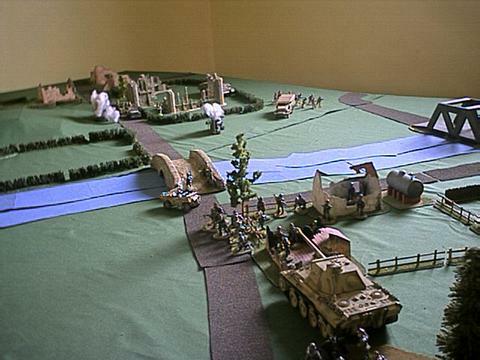 The game unfolds over the terrain with no troops deployed on table. The Germans are all hidden and the Americans are yet to advance on. Notice the density of the terrain, This is a 6 foot by 4 foot layout, and is covered with blocking terrain. In crossfire, everything blocks line of Sight! Whilst an accurate convention for French Bocage, Stalingrad or Burma; I do wonder how well these rules work with the rolling plains of Russia or the trackless deserts of Libya? Troops have no set moves, the attacker simply advances until the enemy does something to interrupt him, or one of the attackers actions fails in such a way as to pass the initiative over. Me and my subordinate commander decided that we'd deny the right flank entirely, knowing that the enemy was out there in some force. 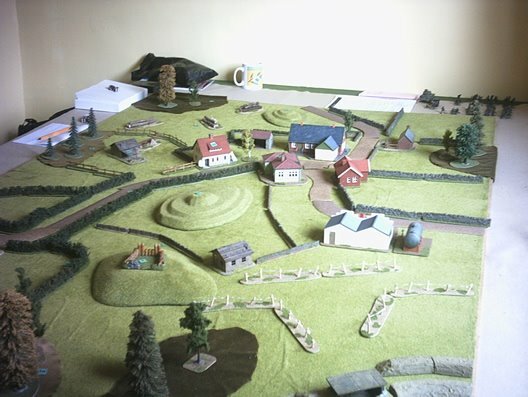 We figured he'd throw most of his forces at the defence of the village, sure fire tank killer terrain. Instead we advanced from the enemy's old bunker positions towards the forest. Our war correspondent records the US advance, sadly the next thing that happened was that the forward platoon advanced into the forest, never to be seen again! It became clear later on that they'd been ambushed by a machine gun and around two platoons of the enemy, Bayonet and close quarter gunshot wounds confirmed the few survivor's reports of a swarm of elite SS soldiers ravenous as wolves pouncing on them without mercy. At least, if the reports of replacements are to be believed. The nature of Crossfire is such that whilst the enemy had to appear to fire on us, he took the first opportunity to disappear also. A second cautious advance towards the emplacement on the hill allowed some emericans to lay fire on the enemy, and call in a tank, that made short work of the survivors. By the time the position was occupied the rest of the enemy had melted away. This set the nature for the next phases of the attack. The Germans tried to redress their lines to deal with the tank; a Marder III - correctly identified by the Americans as a Tiger tank - was repeatedly missed by American Bazooka fire whilst trying to ambush the Sherman. Meanwhile redeployed machine guns and infantry squads used their guns and mortars to decimate another American Platoon. At this point if it hadn't been for the tank support, the US commanders may well have withdrawn. It has to be said Tanks are of doubtful value in Crossfire; the defender can buy 3 anti tank guns for the cost of one Tank to the attacker, tanks can either move - in a straight line only, change face, or fire in a turn. Not all three! This makes them staggeringly slow to deploy; however when used correctly they can bring a hell of a lot of fire to bear. The Sherman accounted for more than a platton of the German infantry, without any harm coming to it. 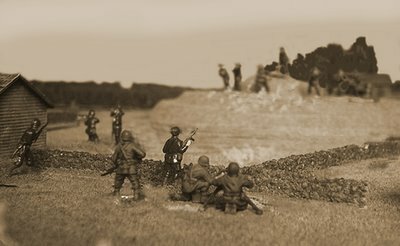 Despite early success, the German flank began to wither under the concentrated US fire, American mortars and machine guns played merry hell with the next, rather exposed positions they found. The Germans were forced to withdraw under pressure, and fell to relying on Volksturm hiding in the village to try desparately to stop the tank and a sweep by A company, accounting for one squad they too were put under steady fire, from now more cautious troops. Incidentally, there are no morale rules that I recall using, whether they exist is beyond me, certainly troops are rated with different qualities, but common sense moves them more often than not. The main problem is troops becoming pinned and suppressed under fire. Troops tend to get wiped out rather than running away. By the end of the game the Marder had been forced to withdraw under threat from Bazooka teams, The Sherman tank, and gutsy infantry armed with grenades and rifles. 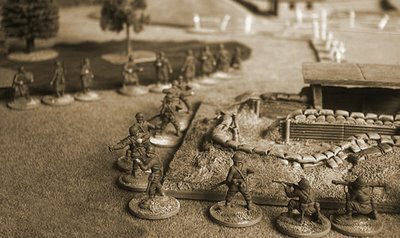 Each side had lost more than two platoons to enemy fire, which left he American troops pretty much spent, We were happy to hunker down and consider it a draw of sorts. As to the rules, they have many strengths, but really only for representing certain types of warfare. They are excellent for those situations where the defender is holed up in determined defence and the attacker has only the most basic idea where they are. For more mobile games their application seems limited. More than a couple of vehicle either side simply would not be practical. Moreover it is impossible for the attacker to go on the defensive in the same manner as normally applied to the nominative defender. In short whilst the attacker has a realistic lack of idea about the enemies movements the defender has a godlike power both to see the every move of the enemy, whilst being able to conduct all his deployment and moves in secret. If this seems unfair, then these are rules you will not get along with; but they work in the right situation, with small enough forces. So, Ive been wargaming for a long time. No, a really long time. In my defence I started very young; back when librairies actually had books on this sort of thing I came across a copy of a Terry Wise book on wargaming and started using a dice to decide which of my 1/35th scale airfix and corner shop soldiers would get blasted out of my back yard trenches next. That sufficed for a while, until a charles grant book fell into my possession with simpler rules. 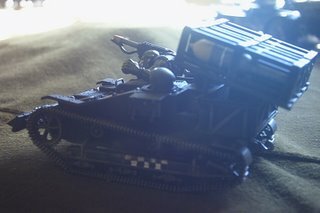 I had something basic to work with, and transferred to 1/72nd scale matchbox and airfix soldiers. Pretty soon a selection of plastic kits that were often beyond the abilities of my eight year old fingers started to follow, along with model railway scenery looted from my dad and brother and a board on the floor of the spare bedroom. As a child opponents were initially easy to find, until most kids either discovered football, girls or beer; after that, in late 1970's Britain, there was no particular hideaways for devotees of toy soldiery. According to the books I had, you needed to be a veteren of at least one world war, and own a tweed jacket to play with model soldiers. Incidentally, to my childhood shame, my parents bought just such a tweed jacket for me, our holidays abroad saw us parade around like Anglican missionaries. Anyway, this devotee made it through the early eighties on solo gaming and it has to be said a fair amount of secrecy about my odd little hobby, arcade games and pop music were a lot cooler things to be able to talk about at school; I kept my head down, studied very occaisinally, and filled a draw and several creakily built shelves with gradually more competantly assembled tanks. 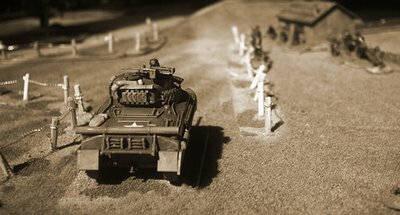 Eventually, when my parents judged it slightly unhealthy that I wasn't inclined to get out much I was allowed to go to an odd little place called a wargaming club; a friend of my dad would go every so often and so I was encouraged to give it a try. From then on it was assured that what may well have been grown out of, when I discovered beer, became an enduring obsession, when I first saw 15mm figures, by the hundred, painted and arrayed on bases together advancing across carefully made terrain on massive tables! Also a like minded group of similar teenaged gamers made for all the social life my folks wanted me to have; I wasn't going to complain either! Over the years since then I've lasped at times; eventually beer and girls got in the way of little men for a few years, there was a questionable period of fantasy gaming and roleplaying (no regrets but I doubt I'll go back to it now). Latterly I had to move away from the wonderful club of my younger days - work can do that to a man (curse it, curse it all to hell!) - and ended up resorting to popular store brands to get any sort of games at all for a while. But once life settled down, the buying of miniatures and the planning of everything from skirmishes to great campaigns began again. The lead and plastic never seem to go away. The last count showed 5000 of the blighters painted on my shelves.